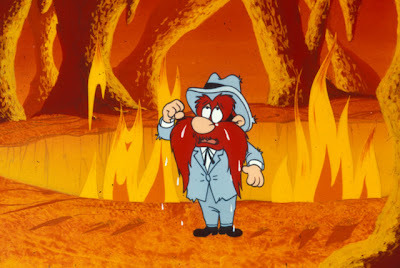 Poor Yosemite Sam. When it comes to Warner Brothers Animation's beloved Looney Tunes, everyone has their favorite character (in my case it was always Road Runner) and sadly, the none-too-bright Sam has never been high on anyone's list. And confirming his status as the Looney Tunes alumni Most Likely to Be Picked Last for Dodgeball-- after he winds up in Hell shortly into one of Friz Freleng's animated cartoons included on this DVD-- even Satan is willing to trade up and let Sam off the hook... provided he returns with a replacement. Predictably, following his pent up rage at being the Jan Brady next to Bugs Bunny's Marcia, Sam tries to hunt the big game. Yet, of course, all the while audiences know that—similar to the way that Wile E. Coyote never caught up with Road Runner (a.k.a. the super fast, spunky precursor to the Energizer Bunny)-- Sam has about a snowball's chance in Hell of capturing Bugs. In the newest Looney Tunes Movie Collection re-release from the studio that's mastered the art of the animated short since its first cartoon debuted in 1930, The Looney, Looney, Looney Bugs Bunny Movie consists of classic Freleng works (including some major award winners) that are interspersed with newer footage (from the '81 release) to weave together a three part feature-length celebration of all things Looney. 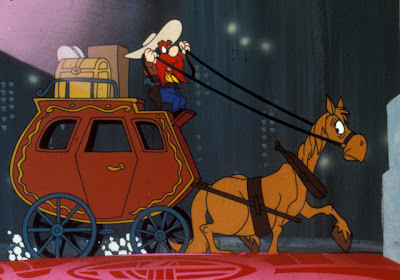 While the Yosemite Sam piece appears shortly in the film's first act and the third one has loads of fun lovingly roasting the Oscars Bugs Bunny style as the characters show their true colors during a fictitious award ceremony for animated players in a clever insider satire, it's the middle act of the film that worked the best. Extending the brief shorts into seamlessly longer stories throughout the Warner Brothers DVD as Unmentionables is augmented by the decision to weave other vintage cartoons into the narrative-- while some of these obvious changes in plot jolt astute viewers-- mostly it's a beneficial decision to get new mileage out of old material to build it into a worthwhile feature film. 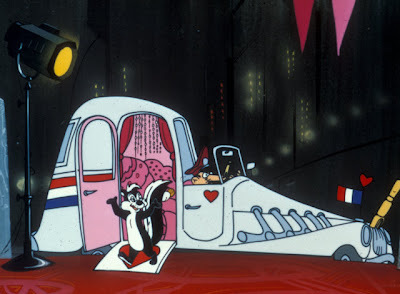 Expertly mixing intelligent multi-layered jokes to ensure the enjoyment of its audience that spans generations-- while the film also includes some delightful bits of humor with Daffy Duck, Tweety Bird, Porky Pig, and Sylvester among others-- it's also a nice find for WB buffs. The disc which also boasts three bonus cartoons-- Box Office Bunny, From Hare to Eternity, and Pullet Surprise-- also contains the following shorts included throughout: Hare Trimmed, Devil's Feud Cake, Roman-Legion Hare, Sahara Hare, Wild and Wooly Hare, The Unmentionables, Golden Yeggs, Catty Cornered, Three Little Bops, High Diving Hare, Show Biz Bugs as well as the Oscar winners Birds Anonymous and Knightly Knight Bus. Thankfully, retaining the original look and feel of the classic shorts by maintaining the standard aspect ratio of the Looney Tunes as they initially premiered, it goes a long way in ensuring that Freleng's original work is respected in this worthwhile who's who of WB greats, even if sadly some things never change concerning that Hell-bound Yosemite Sam.